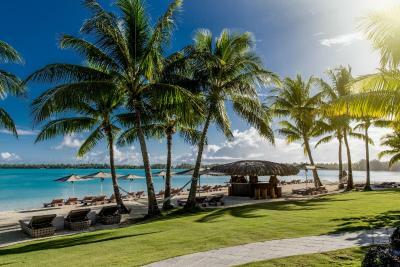 Lock in a great price for The St Regis Bora Bora Resort – rated 9.3 by recent guests! Perfect for Honeymoon. Get everything you need & want in Regis. I loved staying here and sure will be there for our anniversary.Thank for an amazing stay with you guys it was how i imaged our honey moon will be. Wish we could stay 1 more date but we had to leave the catch an airplane.Wish they had another hour later in the day for us to stay one more day. This is probably the best resort/hotel we’ve ever stayed in. Everything was phenomenal. The views, the extraordinary friendly and professional staff, especially Ida our butler, the facilities and the great food all made this a memorable stay. Highly recommended! Fabulous property, beautiful beach, exceptional service, amazing room and amenities. All in all, top notch🤗! 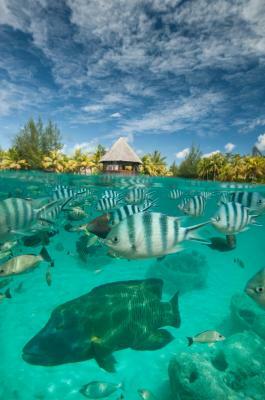 Location, Staff , Design of the Resort, Fish Feeding and Snorkel. It’s a gorgeous property with lots to do: paddle-board, kayak, snorkel, spa, bike ride, swim, or just relax. For me though the staff really make the stay special. They were all so kind and attentive. My butler Sebastien took care of everything for me: dinner reservations, excursions, spa reservations, etc... I got very spoiled! The spa staff were so sweet and helpful (Amandine at the front desk and Andrea for treatments). And the dining staff (Elise and Rai and everyone else) were so friendly and attentive. I was traveling alone as a recent widow and they all made me feel very welcome and comfortable. Everything in this hotel is perfect. The staff is so friendly, every day they will greet you like a friend you haven't seen in years and they call you by your name! The food is awesome, breakfast is delicious and the restaurants have the best food I have ever tried in a hotel. It is paradise! Way beyond our expectations! Nothing else to say. It was like a dream. 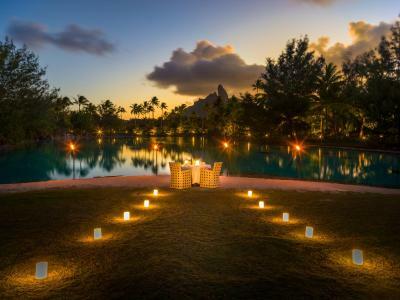 The St Regis Bora Bora Resort This rating is a reflection of how the property compares to the industry standard when it comes to price, facilities and services available. It's based on a self-evaluation by the property. Use this rating to help choose your stay! 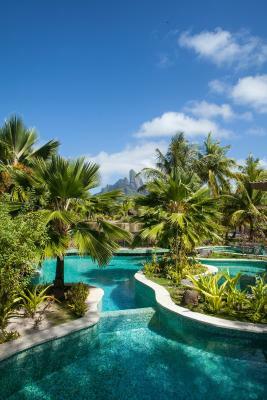 One of our top picks in Bora Bora.Located on the tropical island of Bora Bora, the beachfront St Regis Resort offers 2 swimming pools, 2 bars, 4 restaurants and a luxurious day spa. 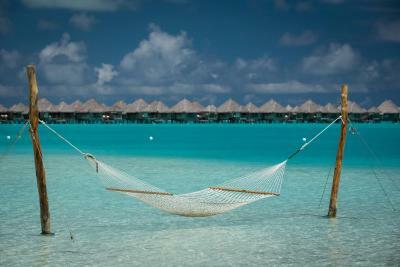 All accommodations features a balcony offering panoramic views of the lagoon or surrounding islands. 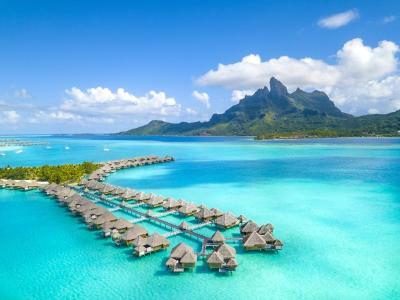 The St. Regis Bora Bora Resort is a 15-minute boat transfer from Bora Bora Airport. Vaitape Village can be reached via a 20-minute boat and car journey. 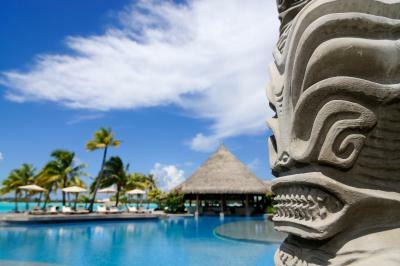 The air-conditioned villas feature hand-carved Polynesian sculptures, exotic wooden décor and an Italian-marble bathroom with a rain shower and bathtub. 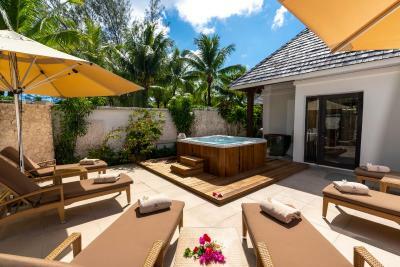 Some villas offer a private pool, a whirlpool or an outdoor shower. 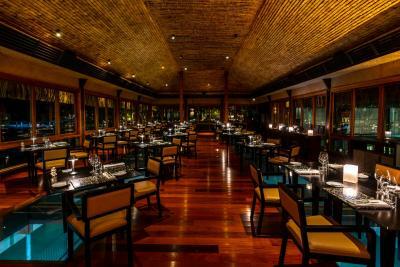 Suspended over the blue waters, The Lagoon Restaurant offers a fusion between Asian and French cuisines and views of Mount Otemanu. Aparima Bar serves international dishes and light snacks all day, while Bam Boo Restaurant offers precisely crafted sushi, sizzling teppanyaki and fragrant woks. Far Niente features Italian cuisine. Miri Miri Spa features massage services, a sauna, a hamman, a steam room and beauty treatments. 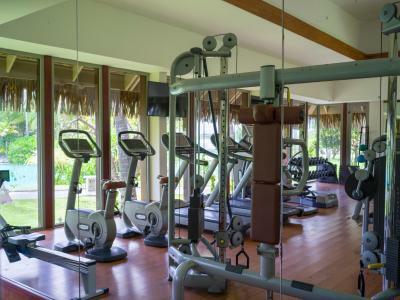 Other facilities include a 24/7 fitness center and a butler service. 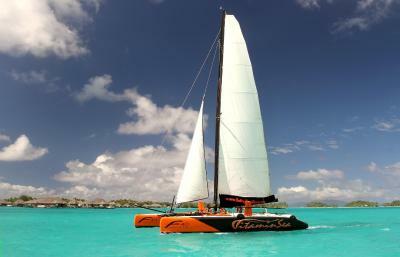 Guests enjoy free use of snorkeling and windsurfing equipment, beach side cabanas and sun umbrellas. Free WiFi is available in all areas. 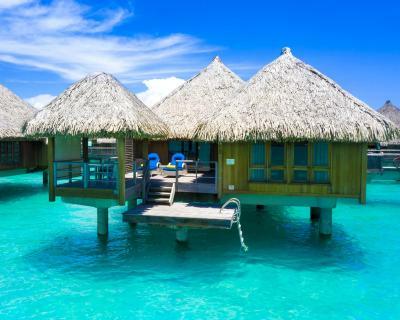 This property also has one of the top-rated locations in Bora Bora! Guests are happier about it compared to other properties in the area. 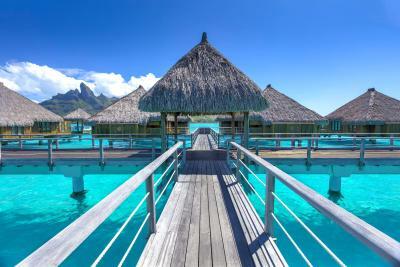 When would you like to stay at The St Regis Bora Bora Resort? Located on the Resort's open ocean side and elevated from the coral beach, this villa features a pool with views of the ocean. These spacious and private suites include a large separate lounge area and a bedroom with adjoining bathroom, which opens up to enclosed gardens with an open air shower. Located on the Resort's open ocean side and elevated from the coral beach, this villa features a pool with views of the ocean. These spacious and private suites include a large separate lounge area and a bedroom with adjoining bathroom, which opens up to enclosed gardens with an open air shower. 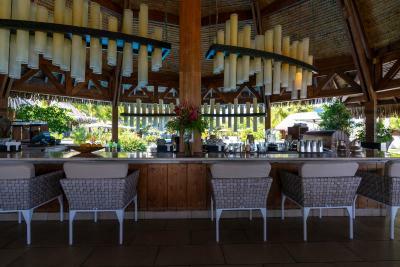 The expansive terrace offers two dining gazebos and you can relax in the pool, while enjoying the views of the open ocean as well as Taha'a & Raiatea islands. Please note the rates are for single, double, triple or quadruple occupancy only. Maximum occupancy is 6 guests. Each additional adult will be charged 21 660 XPF per person and per night. From April 1st, 2019, this extra adult charge will be 25 190 XPF per person and per night. Set back amid lush palm fronds, these villas offer direct access to the white sands and gentle waves of the Resort's calm bay. They are suites featuring a separate lounge area and bedroom with adjoining bathroom that opens up to an enclosed garden with an open air shower. 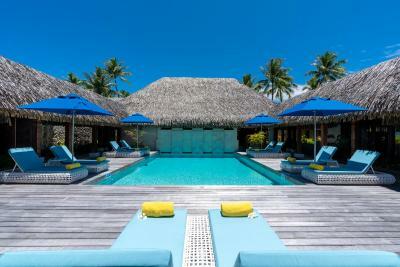 The spacious terrace includes a dining gazebo and private plunge pool, overlooking Bora Bora's stunning lagoon. Please note the rates are for single/double occupancy only. Maximum occupancy is 3 guests. Each additional adult will be charged 21 660 XPF per person and per night. From April 1st, 2019, this extra adult charge will be 25 190 XPF per person and per night. 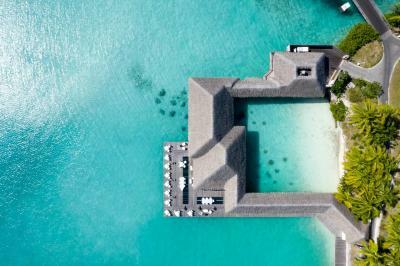 These large overwater villas face a tranquil bay and feature a separate lounge area and a bedroom with adjoining bathroom. Glass viewing panels throughout the Villas offer captivating glimpses into the turquoise waters below. 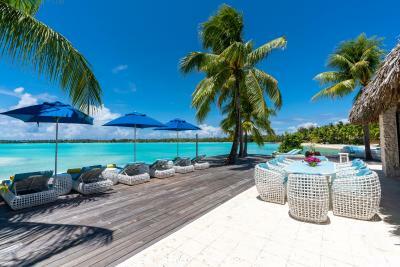 The spacious terrace includes a dining gazebo, overlooking Bora Bora's stunning lagoon. 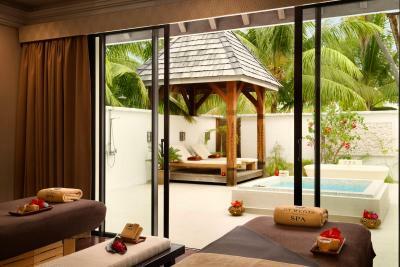 These villas are angled towards the main island and feature a separate lounge area and bedroom with adjoining bathroom. Glass viewing panels throughout the Villas offer captivating glimpses into the turquoise waters below. 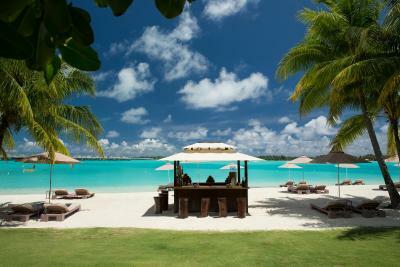 The spacious terrace includes a dining gazebo, overlooking Bora Bora's stunning lagoon. 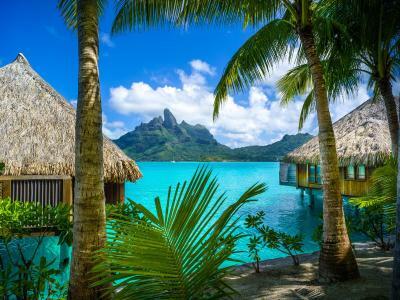 These Villas offer guaranteed views of Bora Bora's iconic Mount Otemanu. They feature a separate lounge area and bedroom with adjoining bathroom. Glass viewing panels throughout the Villas offer captivating glimpses into the turquoise waters below. 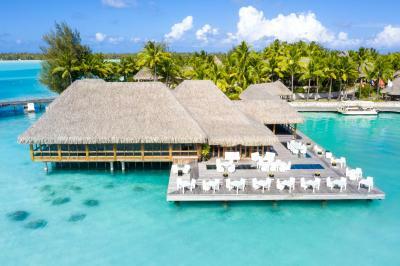 The spacious terrace includes a dining gazebo, overlooking Bora Bora's stunning lagoon. This Premium Villa features a King bed and a large separate lounge area with a daybed. It includes glass viewing panels throughout the Villa, offering captivating glimpses into the turquoise waters below. The spacious terrace includes a dining gazebo and a whirlpool to relax in and enjoy the breathtaking views over Mt. Otemanu. Showcasing large suspended pools over the lagoon in the South Pacific, these suites feature separate lounges and bedrooms with adjoining bathrooms. Glass viewing panels throughout the Villa offers captivating glimpses into the turquoise waters below. The expansive terrace offers two dining gazebos and you can relax in the pool, while enjoying the breathtaking views over Mt. Otemanu. 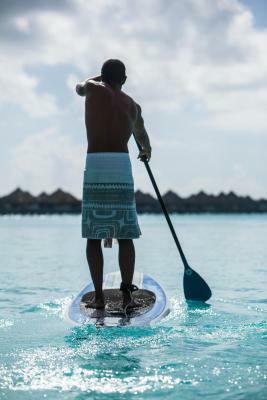 House Rules The St Regis Bora Bora Resort takes special requests – add in the next step! 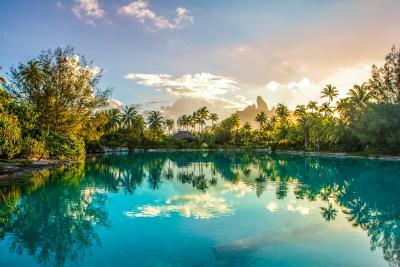 The St Regis Bora Bora Resort accepts these cards and reserves the right to temporarily hold an amount prior to arrival. 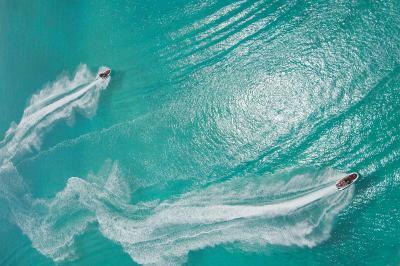 Boat Transfers are available to and from Bora Bora Airport. Guests must contact the property at least 72 hours before travel, using the contact information found on the booking confirmation. 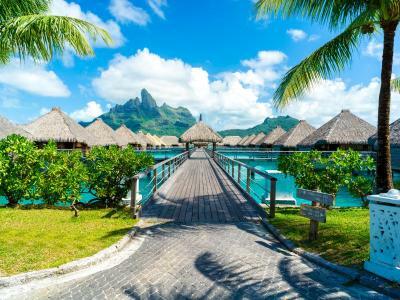 Please inform The St Regis Bora Bora Resort of your expected arrival time in advance. You can use the Special Requests box when booking, or contact the property directly using the contact details in your confirmation. I had to leave 2 days earlier but it was our own fault.We did not know we had to catch a plane earlier. Wish we could get that refunded but its not the staff fault. Housekeeping kept taking away cups etc for cleaning & not replacing them. For at least one of the restaurants it would be really nice if they had local shows, dances etc. The boat transfer from the airport should be definetely included in the hotel price, it shouldnt be extra. They also charge 14 dolars every time you order to your room, rather than doing this, making the prices in the room service menu would be better. If you order one dish, you are paying to the service more than the dish and it feels unfair. It was up to our expectations!!!! When you first arrive it seems to be a paradise but then you realize that is actually a Paradise !!!! Staff very attentive to all your needs at any time and anywhere. We unfortunately spent only 4 days, enough to enjoy as well the amazing 4 restaurants in here. Overwater villas are terrific, spacious well equipped and cleaned twice a day. There’s absolutely nothing to complain about, We will come back for sure!! Food and drink prizes in all the different hotel facilities are too high and there are some questionable ways of making extra money. If you want to leave the ressort to go for dinner on the main island same boat shuttle which is free during the day costs extra. You pay in 4digits per day already and when you take a bottle of water for the night from your minibar you add another 10bucks to your bill. Food is good in all the hotel restaurants, but at horrendous prizes. The only real "wow" dinner was in lagoon restaurant. 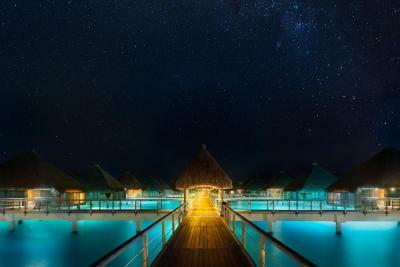 It is really a dream ressort in paradise. It consits of several small islands interconnected with each other. 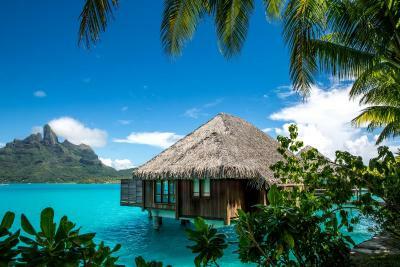 We had an overwater bungalow with unobstructed view to the east side of the lagoon. If you jump in the water directly from your bungalow, unfortunately there is not much to see as it is quite sandy and now corals are there. Once in a while a family of eagle rays might visit you. For snorkeling beginners they have an abolute highlight though: the SPA is located on a seperate island, around that they created an "artificial" lagoon which is supercrowded with all different kind of fishes which are not scared at all as they get feeded regularly and the lagoon entry is blocked for bigger predators by a net. Good quality snorkeling equipment can be lended from them. Gym is well equipped and in good shape. 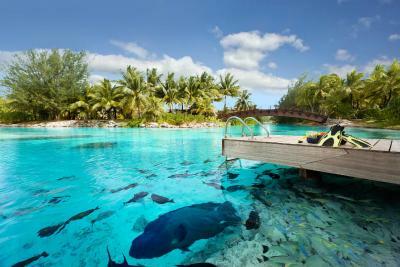 Pool we never tried (lagoon is too beautiful). 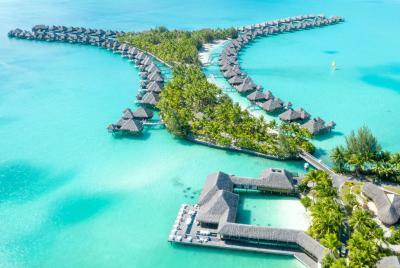 What differentiates SrRegis BoraBora from all other hotels in the world I have been though is the service! 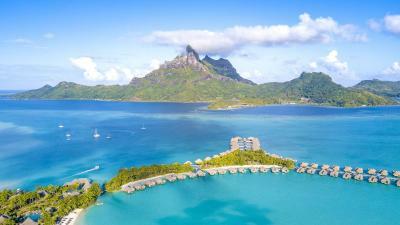 StRegis Butler service is known already, but in BoraBora they really walk the talk from topmanagement downwards. They try to make sure that one of their executive managers catches you every day to chat a bit and find out if everything is fine. I wanted to give some examples of the exceptional service here, but unfortunately the maximum allowed characters of this box does not allow me to. So I leave it with a big thanks to Richard & team for making this a very enjoyable holidays! Everything pretty perfect but maybe choice of restaurants could be slightly better. We went to the lovely Vong one once and really enjoyed it. Having a drink at the outside bar there with the incredible sunsets is wonderful. But we normally ended up in the bar, which was pleasant but got a little samey - the Italian restaurant was ok but nothing special. The buggys always came quickly driven by very charming staff. The breakfast buffet was sensational. Our room was vast and unbelievably comfortable. The property was really attractive to wander around and the staff were all very helpful. The free morning wake up hot drinks were a nice touch. The prices are high but, considering you are in paradise a thousands of miles from anywhere, I guess that is the cost of enjoying creature comforts in tranquility! nice view and great stuff! Butler service is a minus. Breakfast Buffet is a disaster, like 3-star hotel. Serving tap water in breakfast from a caraf. No doctors -dermatolog- in the resort. Not enough information provided during stay about the activities. Average 4star Hotel. Not a 144sqm Rooms as seen in booking.com, 2 toilets would be a huge plus. Room was not clean(I saw a lot of insects such as cockroach-I think it is not but it really looks like cockroach...-, fly, and centiped...). Also butlers' service was worse than I expected. They were kind but my request wasn't solved quickly, so I had to call them repetitively. As you already know, all things are very pricy and the restaurants are not that good. You also have to pay the shuttle to go to the resort even the price of the room is over USD 1000.. Location! You can see the Otemanu mt very easily at St. Regis resort. And I liked resort's all spot! It was really beautiful and good to have fun.